Pattern for the Jolie Laide scarf. Pattern for the lacy scarf I am wearing in my author photo on Yarnplay. Long, fingerless gloves knit with Lorna's Laces Shepherd Sport. Tulip tank top, knit with Katia, Jamaica. i've been taking a little blogging break. i'll be back soon. hope all is well. i'm always curious to know what my music my favorite bands are listening to, what books my favorite authors are into, and which labels are being worn by favorite fashion designers. similarly, i often wonder what my favorite knitting designers are knitting for themselves. naturally, i was thrilled when Wendy Bernard, author of Custom Knits, told me that she was knitting my design, Bibi. i am crazy about the color that she chose for hers (Noro Matsuri, color 1). in fact, i prefer it to the color that i chose for mine. hmm... i may have to knit a second Bibi. awfully quiet around here, huh? i am knitting. a lot actually. i just can't seem to get motivated to blog about it. i'm happily knitting along on Rosa. and i'm attempting to create some pieces for my new etsy shop. oh. and i got sucked in by YA vampire crack. in the meantime, enjoy Lorna's lovely Poppy. this design is from my book Yarnplay. i've completed Courtney. it came out really large around the shoulders and neckline. i did a few rounds of crochet (working every other stitch) around the neckline in order to make it smaller. now it fits great and i'm really pleased with it. yarn: Kidsilk Haze in color 632, Hurricane. 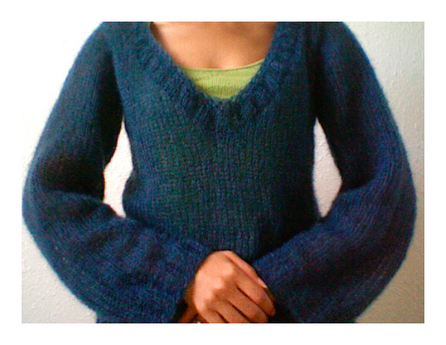 This is a gallery of projects that readers of my blog have knit from my designs.